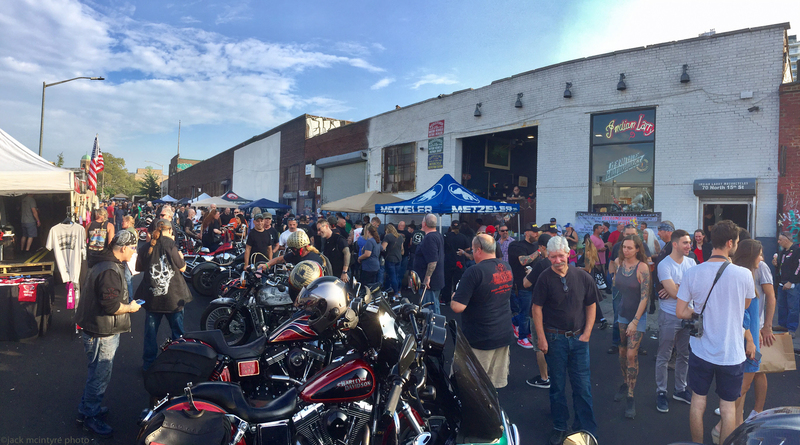 THE INDIAN LARRY MOTORCYCLES BLOCK PARTY 2017 | GROWTH THROUGH IMMEDIATE EXPOSURE IS OUR GOAL. September 16, 2017: So what did we do today? Took off from Philly at 05:00 and arrived in Brooklyn NY bright and early for the set up of the Indian Larry Motorcycle Grease Monkey Block Party, 2017. This is an example of one of the greatest dedications of fans of the brand Indian Larry, and the generosity of all involved to continually donate to the Aidan Jack Seeger Foundation. I walked the event shooting pics & talking with friends & visitors, and the event , as always, provided entertainment from one end to the other as seen in my images below. Motorcycles lined the surrounding streets, with a mix of custom cars, FXR stunt shows, music all day / night, and more. Enjoy the images, visit the Aidan has a Posse website if you can to donate & learn, and come to the party on 2018!